We found this in the Everett Public Library. 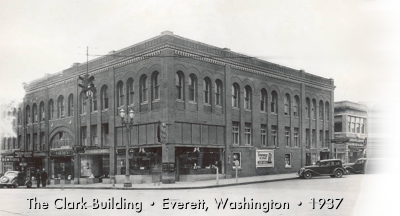 In 1892, brothers John, Alex and Robert Clark founded Clark's Department Store (AKA Clark Clothing Co.) to provide dry goods to the working families who were engaged in mining, lumbering, and construction in the new city of Everett and surrounding Puget Sound communities. The firm started business in a rented circus tent, before completing their landmark store, which was demolished in the 1950s. For several early years, the City Council met on the third floor in an unofficial City Hall. Descendants of Alex founded Clark Internet Publishing in 1994.